There's already a wealth of spice and dried fruit in hot cross buns, so they easily convert to these puddings. The custard is delicately spiced and light, as it's made from milk not cream, giving a fluffier overall texture. Preheat the oven to 180°C, gas mark 4. Prepare a bain marie by placing a roasting pan half-full of warm water into the oven. Using a 7cm round cutter, stamp out a round from the centre of each bun. Cut each bun horizontally into 3 and butter 1 side of each slice. Whisk together the remaining ingredients for the custard. 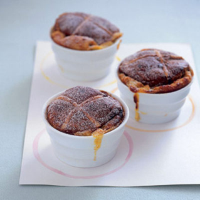 Place the base of each bun in a 200ml (8cm) ramekin and pour over some custard. Top each of the six with a middle slice, some more custard and finally with the crosses. Leave to soak for 20 minutes, topping up with custard. Bake in the bain marie for 35 minutes, till puffed and golden. Dust with icing sugar; serve with pouring cream if you like. The nutmeggy aroma of the buns and the custardy texture both work well with a raisiny Muscat.